This is a purely informational site about orgonite, a simple compound anyone can create in their backyard with fairly inexpensive, widely-available materials which balances ambient energy by turning the negative energy into positive energy, with many easily-confirmed effects. Orgonite does this continuously, 24 hours a day, 7 days a week, without electricity. This is not a joke, or a game, or an advertisement. This is not a business opportunity. We don't want your money. Orgonite vendors exist only to serve those who are not able to or interested in making orgonite themselves. 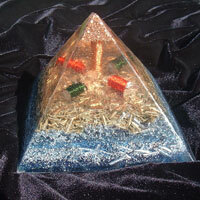 Orgonite does not require belief or conscious intention in order to work. This is not a religion, a cult, or a product of disinformation of any kind. This has nothing whatsoever to do with the "newage movement." We have found that tactical deployment of orgonite (e.g., "gifting") by throwing, hiding or burying it near sources of electromagnetic radiation or other pollution or in polluted areas, such as near cellphone/TV/radio towers, power plants, in lakes, rivers and ocean harbors, has a powerful and noticeable effect on the area. The skies get clearer and return to the deep blue color you remember from your childhood, complete with normal puffy white clouds. Water pollution levels decrease precipitously, as documented in Toronto, Ontario. Drought conditions are reversed, as documented in South Africa and in Death Valley, California. The general mood or "vibe" in the area improves dramatically as people are kinder, happier and more easy-going. Neighbors either become friendlier or suddenly leave town. A renewed sense of hope begins to pervade the community. We have seen this effect in our own communities as a direct result of tactical orgonite gifting, and have found it truly self-empowering, but don't take our word for it. Try it yourself and see what happens! There are those of us involved with this "gifting movement" who believe that the proliferation of electromagnetic pollution, cellphone towers and chemtrails are not an accident, but are intentional acts of malfeasance by the parties who seek to benefit or profit from inflicting illnesses upon the populace. We don't ask that you believe us, or subscribe to our beliefs. What we do ask is that you help combat the pollution that is wreaking so much harm throughout our communities around the world. We ask you to contribute to the health and well-being of your friends, family and neighbors by following the simple steps outlined on this site, regardless of whether you agree with our personal opinions and convictions. We ask that you follow the instructions here and seek your own personal confirmation of the effectiveness of orgonite.